GARAMBA-NORTHEASTERN CONGO 11/9/15 – Ivory trade is so lucrative that gangs have been formed for the killing of thousands of elephants. The don of these gangs, Boniface Matthew Mariango, has been caught and arrested by Tanzanian officials according to John R. Platt, who writes for Scientific American as well as other publications. Mariango – nicknamed "Shetani," or 'Devil," allegedly managed up to 15 criminal poaching and ivory smuggling syndicates. Another arrest of interest a month before is that of Yang Feng Glan who has been called, "The Queen of Ivory" and is charged with smuggling 706 elephant tusks. She was an active ivory smuggler for the past 10 years. Think of the many elephants that were brutally killed to increase her profit margin. These arrests were not by the efforts or attempt by the governments of those areas. 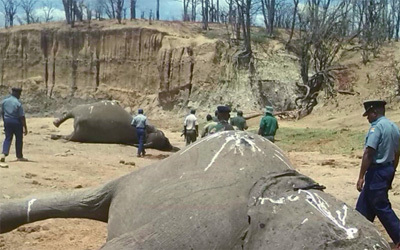 These significant captures were through the work of NON-government organizations, Elephant Action League and WildLeaks. The latter group was organized in 2014 to fight wildlife crime by collecting intelligence and conducting investigations into animal trafficking and poaching. Kathleen Garrigan, media relations manager for the African Wildlife Foundation, said in frustration: "Ultimately if we are going to dismantle these international syndicates, we must remove the middlemen and bring down the kingpins." We must put a stop to the profits. What is more, we must stay on top of these arrests to make certain the murderers get their just punishments, justifiable harsh punishments. Even though arrests have been made, there are still many more greedy people out there who will take their place and murder for profit. However, neither 'Devil" nor the "Queen of Ivory" has gone to trial. As usual, many poachers and smugglers get off with little more than a slap on the wrist – or less. "These cases need to be followed to their conclusion," Ms. Garrigan said. "Too often we see arrests but no convictions, or else laughable punishments given to poachers and traffickers." She went on to say that there was a recent case in Tanzania, in which the African Wildlife Foundation's partners arrested 'a notorious elephant poacher and his gang, only to have them all released by the courts on bail.' Then, like many before them, disappeared immediately after their release. To them it was worth the forfeiting of bail money for the profits yet to come. Special thanks to writer John R. Platt, who broke the original story. Photo Caption: Corrupt Park Rangers survey the elephants they killed for Ivory.